NTRT GEST(Girl Education Scholarship Test) 2018/NTR Trust Merit Scholarship Test 2018/NTR Educational Institutions Merit Scholarship Details, Exam date: NTR Trust is committed to give quality education for meritorious girl students. To identify the beneficiaries NTR trust is conducting GEST-2018. Total 25 students will get a merit scholarship of Rs 5,000/- per month to persue their intermediate in AP & TS for two years. Out of 25 Selected students, 10 students can avail this scholarship in any college of their choice, 15 students can avail this facility in NTR Junior college, HYD. 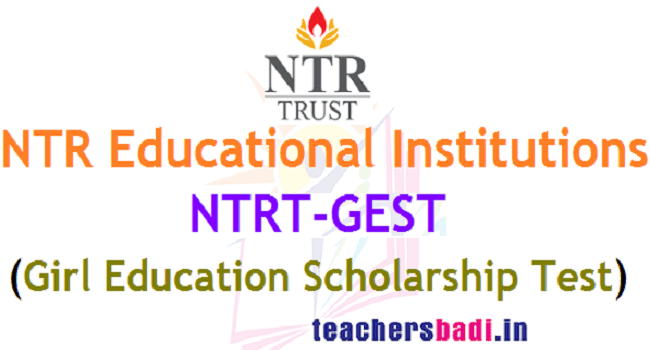 ntrt gest girl education merit scholarship test 2018, ntr trust merit scholarship test 2018, application form, last date, exam date, ntr educational institutions merit scholarship and how to apply more details given here. How to Apply: Candidates can apply through online mode at http://ntrtrust.org/education/. So, Eligible and interested candidates should fill the Online Application Form with required information. Please fill the below form with proper attention. About NTR Trust: Established in 1997, NTR Memorial Trust has been at the forefront of bringing socio-economic change in Andhra Pradesh and Telangana. It endeavours to create opportunities for the underprivileged to achieve their full potential, safeguarding health and safety and reducing poverty and instances of injustice. Our work is guided by an important principle: that we are guardians of private funds which must be utilized in the public’s interest. We are inspired by NTR’s deeply held belief: that sharing and caring are the ultimate goal of human life. VISION: They move forward with the ultimate desire of ensuring a robust society where every segment of the society in every sphere of activity is productive, happy, healthy and self-reliant.